StoryCruz sat in on one of UC Santa Cruz's student-led crochet circles, which are part of the Crochet Coral Reef satellite project. Take a listen to the podcast. Stitch by stitch, row by row, a bright and vibrant coral reef is growing at UC Santa Cruz. 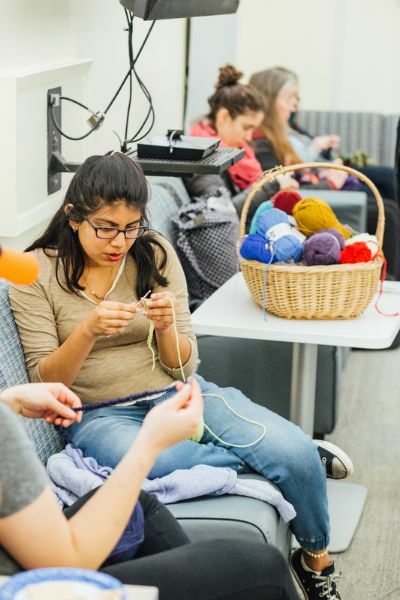 Groups of crochet enthusiasts—both students and Santa Cruz community members—have been meeting for student-led crochet circles. It's made out of wool, but it looks a lot like the real thing, with swirls, loops, coils, and squiggles galore. The Crochet Coral Reef is a massive participatory art project that was created in 2005 by the sisters Christine and Margaret Wertheim of the Institute for Figuring, a Los Angeles–based organization that delves into the aesthetic and poetic aspects of the sciences. Since then, the project has spread across the globe. In fact, the Crochet Coral Reef is the biggest participatory science and art project on Earth at the moment, according to the Wertheim sisters. The Mary Porter Sesnon Gallery is running an exhibition of the Wertheim sisters' art, Crochet Coral Reef: CO2CA-CO2LA Ocean, through May 6, 2017. The exhibit features the coral reef crochet of the Wertheim sisters and their collaborators. The sisters, who grew up in Queensland, Australia, near the Great Barrier Reef, describe it as a worldwide “wooly celebration of the intersection of higher geometry and feminine handicraft, and a testimony to the disappearing wonders of the marine world.” Since the project’s humble beginnings, it has expanded to include “satellite coral reef” projects in 35 cities and countries worldwide, and as far-flung as Ireland, Germany, and Latvia. One of those satellites has been established at UC Santa Cruz, under the auspices of UC Santa Cruz’s Institute of the Arts and Sciences (IAS), which is funding and organizing the project. So far, more than 200 UC Santa Cruz students, and 200 area residents, have contributed to the satellite reef, which will go on display at the Seymour Marine Discovery Center starting on May 4, 2017. The participants are hoping the display will look like a three-dimensional grotto of coral. It would be a mistake to call the satellites spin-off projects because each satellite reef is part of one enormous whole. In this sense, the project mirrors nature; every coral reef is the work of thousands of tiny organisms. One chilly January evening at UC Santa Cruz, a group of crochet enthusiasts—a dozen students and four Santa Cruz community members—met for a student-led crochet circle at a multipurpose space known as the Red Room at Rachel Carson College to work on the satellite project. They concentrated on their work, adding wooly flourishes to the simulated reef. No one in the crochet circle strives for absolute perfection. To do so would be unnatural. Artmakers say the reef-building experience is deeply meditative and a great excuse to shut off annoying smartphones and other devices. “It is a material thing that demands the attention of your eyes and hands in a continuous way so you can't really get distracted by other things,’’ said Sophia DiMatteo (Merrill ’17, history of art and visual culture), one of three interns selected for year-long paid internships with the IAS. DiMatteo and fellow interns Gracia Brown (College 10 ’18) and Lucy Ashton (Kresge ’18, history of art and visual culture) are leading the student crochet circles. By following a surprisingly basic algorithm, but also varying and “mutating” the pattern, the crochet artist can replicate the squiggles of “brain coral,” and make all sorts of fringed, loopy, curly, swirly, crenelated forms that can be found in life forms under the sea. Nelson said that in any given satellite project, only 3 percent of the participants are men. “At UC Santa Cruz, it’s more like 30 percent,’’ she said. 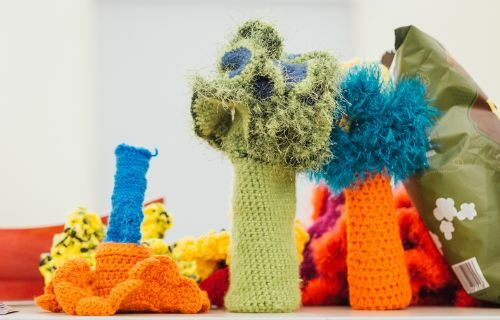 She attributed that high participation to an art course taught by Art Department lecturer Kathleen Perry, who asked her students to take part in the Crochet Coral Reef. 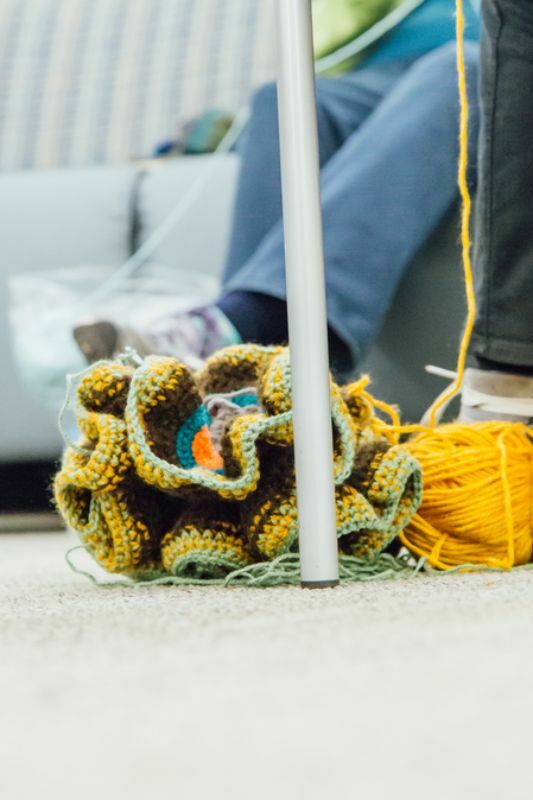 To find out more about the crochet circles at UC Santa Cruz and the ongoing project, visit the homepage for the satellite project. The contact email for the crochet group is ias@ucsc.edu.